Communicating systems use well-defined formats for exchanging various messages. Each message has an exact meaning intended to elicit a response from a range of possible responses pre-determined for that particular situation. The specified behavior is typically independent of how it is to be implemented. Communication protocols have to be agreed upon by the parties involved. To reach an agreement, a protocol may be developed into a technical standard. A programming language describes the same for computations, so there is a close analogy between protocols and programming languages: protocols are to communication what programming languages are to computations. Multiple protocols often describe different aspects of a single communication. A group of protocols designed to work together are known as a protocol suite; when implemented in software they are a protocol stack. Internet communication protocols are published by the Internet Engineering Task Force (IETF). The IEEE handles wired and wireless networking, and the International Organization for Standardization (ISO) handles other types. The ITU-T handles telecommunication protocols and formats for the public switched telephone network (PSTN). As the PSTN and Internet converge, the standards are also being driven towards convergence. The information exchanged between devices through a network or other media is governed by rules and conventions that can be set out in communication protocol specifications. The nature of a communication, the actual data exchanged and any state-dependent behaviors, is defined by these specifications. In digital computing systems, the rules can be expressed by algorithms and data structures. Protocols are to communication what algorithms or programming languages are to computations. Operating systems usually contain a set of cooperating processes that manipulate shared data to communicate with each other. This communication is governed by well-understood protocols, which can be embedded in the process code itself. In contrast, because there is no shared memory, communicating systems have to communicate with each other using a shared transmission medium. Transmission is not necessarily reliable, and individual systems may use different hardware or operating systems. To implement a networking protocol, the protocol software modules are interfaced with a framework implemented on the machine's operating system. This framework implements the networking functionality of the operating system. When protocol algorithms are expressed in a portable programming language the protocol software may be made operating system independent. The best known frameworks are the TCP/IP model and the OSI model. At the time the Internet was developed, abstraction layering had proven to be a successful design approach for both compiler and operating system design and, given the similarities between programming languages and communication protocols, the originally monolithic networking programs were decomposed into cooperating protocols. This gave rise to the concept of layered protocols which nowadays forms the basis of protocol design. Systems typically do not use a single protocol to handle a transmission. Instead they use a set of cooperating protocols, sometimes called a protocol suite. Some of the best known protocol suites are TCP/IP, IPX/SPX, X.25, AX.25 and AppleTalk. The protocols can be arranged based on functionality in groups, for instance there is a group of transport protocols. The functionalities are mapped onto the layers, each layer solving a distinct class of problems relating to, for instance: application-, transport-, internet- and network interface-functions. To transmit a message, a protocol has to be selected from each layer. The selection of the next protocol is accomplished by extending the message with a protocol selector for each layer. Getting the data across a network is only part of the problem for a protocol. The data received has to be evaluated in the context of the progress of the conversation, so a protocol must include rules describing the context. These kind of rules are said to express the syntax of the communication. Other rules determine whether the data is meaningful for the context in which the exchange takes place. These kind of rules are said to express the semantics of the communication. Digital message bitstrings are exchanged. The bitstrings are divided in fields and each field carries information relevant to the protocol. Conceptually the bitstring is divided into two parts called the header and the payload. The actual message is carried in the payload. The header area contains the fields with relevance to the operation of the protocol. Bitstrings longer than the maximum transmission unit (MTU) are divided in pieces of appropriate size. Addresses are used to identify both the sender and the intended receiver(s). The addresses are carried in the header area of the bitstrings, allowing the receivers to determine whether the bitstrings are of interest and should be processed or should be ignored. A connection between a sender and a receiver can be identified using an address pair (sender address, receiver address). Usually some address values have special meanings. An all-1s address could be taken to mean an addressing of all stations on the network, so sending to this address would result in a broadcast on the local network. The rules describing the meanings of the address value are collectively called an addressing scheme. Sometimes protocols need to map addresses of one scheme on addresses of another scheme. For instance to translate a logical IP address specified by the application to an Ethernet MAC address. This is referred to as address mapping. When systems are not directly connected, intermediary systems along the route to the intended receiver(s) need to forward messages on behalf of the sender. On the Internet, the networks are connected using routers. The interconnection of networks through routers is called internetworking. Error detection is necessary on networks where data corruption is possible. In a common approach, CRCs of the data area are added to the end of packets, making it possible for the receiver to detect differences caused by corruption. The receiver rejects the packets on CRC differences and arranges somehow for retransmission. Acknowledgement of correct reception of packets is required for connection-oriented communication. Acknowledgements are sent from receivers back to their respective senders. Packets may be lost on the network or be delayed in transit. To cope with this, under some protocols, a sender may expect an acknowledgement of correct reception from the receiver within a certain amount of time. Thus, on timeouts, the sender may need to retransmit the information. [a] In case of a permanently broken link, the retransmission has no effect so the number of retransmissions is limited. Exceeding the retry limit is considered an error. 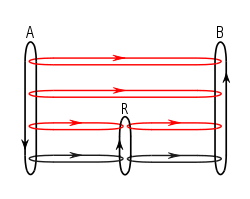 Direction needs to be addressed if transmissions can only occur in one direction at a time as on half-duplex links or from one sender at time as on a shared medium. This is known as media access control. Arrangements have to be made to accommodate the case of collision or contention where two parties respectively simultaneously transmit or wish to transmit. If long bitstrings are divided in pieces and then sent on the network individually, the pieces may get lost or delayed or, on some types of networks, take different routes to their destination. As a result, pieces may arrive out of sequence. Retransmissions can result in duplicate pieces. By marking the pieces with sequence information at the sender, the receiver can determine what was lost or duplicated, ask for necessary retransmissions and reassemble the original message. Flow control is needed when the sender transmits faster than the receiver or intermediate network equipment can process the transmissions. Flow control can be implemented by messaging from receiver to sender. Systems engineering principles have been applied to create a set of common network protocol design principles. Design of complex protocols often involves decomposition into simpler, cooperating protocols. Such a set of cooperating protocols is sometimes called a protocol family or a protocol suite, within a conceptual framework. The literature presents numerous analogies between computer communication and programming. In analogy, a transfer mechanism of a protocol is comparable to a central processing unit (CPU). The framework introduces rules that allow the programmer to design cooperating protocols independently of one another. Protocols are to computer communication what programming languages are to computation. Figure 2. The TCP/IP model or Internet layering scheme and its relation to some common protocols. In modern protocol design, protocols are layered to form a protocol stack. Layering is a design principle which divides the protocol design task into smaller steps, each of which accomplishes a specific part, interacting with the other parts of the protocol only in a small number of well-defined ways. Layering allows the parts of a protocol to be designed and tested without a combinatorial explosion of cases, keeping each design relatively simple. The communication protocols in use in the Internet are designed to function in diverse and complex settings. Internet protocols are designed for simplicity and modularity in interoperating, and fit into a coarse hierarchy of functional layers, traditionally called the TCP/IP model, or Internet Protocol Suite. The name TCP/IP arose from the first two cooperating protocols, the Transmission Control Protocol (TCP) and the Internet Protocol (IP), that resulted from the decomposition of the original Transmission Control Program, a monolithic communication protocol, into the first two layers of the communication suite. This model was expanded to four layers by additional protocols. However, the Internet protocol development has not focussed on the principle of layering as mandatory recipe for communication, rather it evolved as a convenient description of modularity and protocol cooperation. A different model is the OSI seven layer model, which was developed internationally as a rigorous reference model for general communication, with much stricter rules of protocol interaction and a rigorous layering concept of functionality. Typically, application software is built upon a robust data transport layer. Underlying this transport layer is a datagram delivery and routing mechanism that is typically connectionless in the Internet. Packet relaying across networks happens over another layer that involves only network link technologies, which are often specific to certain physical layer technologies, such as Ethernet. Layering provides opportunities to exchange technologies when needed, for example, protocols are often stacked in a tunneling arrangement to accommodate connection of dissimilar networks. For example, IP may be tunneled across an Asynchronous Transfer Mode (ATM) network. Figure 3. Message flows using a protocol suite. Black loops show the actual messaging loops, red loops are the effective communication between layers enabled by the lower layers. Protocol layering now forms the basis of protocol design. It allows the decomposition of single, complex protocols into simpler, cooperating protocols, but it is also a functional decomposition, because each protocol belongs to a functional class, called a protocol layer. The protocol layers each solve a distinct class of communication problems. The Internet protocol suite consists of the following layers: application-, transport-, internet- and network interface-functions. Together, the layers make up a layering scheme or model. Computations deal with algorithms and data and communication involves protocols and messages, so the analog of a data flow diagram is some kind of message flow diagram. To visualize protocol layering and protocol suites, a diagram of the message flows in and between two systems, A and B, is shown in figure 3. The systems both make use of the same protocol suite. The vertical flows (and protocols) are in system and the horizontal message flows (and protocols) are between systems. The message flows are governed by rules, and data formats specified by protocols. The blue lines therefore mark the boundaries of the (horizontal) protocol layers. The vertical protocols are not layered because they don't obey the protocol layering principle which states that a layered protocol is designed so that layer n at the destination receives exactly the same object sent by layer n at the source. The horizontal protocols are layered protocols and all belong to the protocol suite. Layered protocols allow the protocol designer to concentrate on one layer at a time, without worrying about how other layers perform. The vertical protocols need not be the same protocols on both systems, but they have to satisfy some minimal assumptions to ensure the protocol layering principle holds for the layered protocols. This can be achieved using a technique called Encapsulation. Usually, a message or a stream of data is divided into small pieces, called messages or streams, packets, IP datagrams or network frames depending on the layer in which the pieces are to be transmitted. The pieces contain a header area and a data area. The data in the header area identifies the source and the destination on the network of the packet, the protocol, and other data meaningful to the protocol like CRC's of the data to be sent, data length, and a timestamp. The rule enforced by the vertical protocols is that the pieces for transmission are to be encapsulated in the data area of all lower protocols on the sending side and the reverse is to happen on the receiving side. The result is that at the lowest level the piece looks like this: 'Header1,Header2,Header3,data' and in the layer directly above it: 'Header2,Header3,data' and in the top layer: 'Header3,data', both on the sending and receiving side. This rule therefore ensures that the protocol layering principle holds and effectively virtualizes all but the lowest transmission lines, so for this reason some message flows are coloured red in figure 3. To ensure both sides use the same protocol, the pieces also carry data identifying the protocol in their header. The design of the protocol layering and the network (or Internet) architecture are interrelated, so one cannot be designed without the other. Some of the more important features in this respect of the Internet architecture and the network services it provides are described next. The Internet offers universal interconnection, which means that any pair of computers connected to the Internet is allowed to communicate. Each computer is identified by an address on the Internet. All the interconnected physical networks appear to the user as a single large network. This interconnection scheme is called an internetwork or internet. Conceptually, an Internet addresses consists of a netid and a hostid. The netid identifies a network and the hostid identifies a host. The term host is misleading in that an individual computer can have multiple network interfaces each having its own Internet address. An Internet Address identifies a connection to the network, not an individual computer. The netid is used by routers to decide where to send a packet. Network technology independence is achieved using the low-level address resolution protocol (ARP) which is used to map Internet addresses to physical addresses. The mapping is called address resolution. This way physical addresses are only used by the protocols of the network interface layer. The TCP/IP protocols can make use of almost any underlying communication technology. Physical networks are interconnected by routers. Routers forward packets between interconnected networks making it possible for hosts to reach hosts on other physical networks. The message flows between two communicating systems A and B in the presence of a router R are illustrated in figure 4. Datagrams are passed from router to router until a router is reached that can deliver the datagram on a physically attached network (called direct delivery). To decide whether a datagram is to be delivered directly or is to be sent to a router closer to the destination, a table called the IP routing table is consulted. The table consists of pairs of networkids and the paths to be taken to reach known networks. The path can be an indication that the datagram should be delivered directly or it can be the address of a router known to be closer to the destination. A special entry can specify that a default router is chosen when there are no known paths. All networks are treated equal. A LAN, a WAN or a point-to-point link between two computers are all considered as one network. A Connectionless packet delivery (or packet-switched) system (or service) is offered by the Internet, because it adapts well to different hardware, including best-effort delivery mechanisms like the ethernet. Connectionless delivery means that the messages or streams are divided into pieces that are multiplexed separately on the high speed intermachine connections allowing the connections to be used concurrently. Each piece carries information identifying the destination. The delivery of packets is said to be unreliable, because packets may be lost, duplicated, delayed or delivered out of order without notice to the sender or receiver. Unreliability arises only when resources are exhausted or underlying networks fail. The unreliable connectionless delivery system is defined by the Internet Protocol (IP). The protocol also specifies the routing function, which chooses a path over which data will be sent. It is also possible to use TCP/IP protocols on connection oriented systems. Connection oriented systems build up virtual circuits (paths for exclusive use) between senders and receivers. Once built up the IP datagrams are sent as if they were data through the virtual circuits and forwarded (as data) to the IP protocol modules. This technique, called tunneling, can be used on X.25 networks and ATM networks. A reliable stream transport service using the unreliable connectionless packet delivery service is defined by the transmission control protocol (TCP). The services are layered as well and the application programs residing in the layer above it, called the application services, can make use of TCP. Programs wishing to interact with the packet delivery system itself can do so using the user datagram protocol (UDP). Having established the protocol layering and the protocols, the protocol designer can now resume with the software design. The software has a layered organization and its relationship with protocol layering is visualized in figure 5. The software modules implementing the protocols are represented by cubes. The information flow between the modules is represented by arrows. The (top two horizontal) red arrows are virtual. The blue lines mark the layer boundaries. To send a message on system A, the top module interacts with the module directly below it and hands over the message to be encapsulated. This module reacts by encapsulating the message in its own data area and filling in its header data in accordance with the protocol it implements and interacts with the module below it by handing over this newly formed message whenever appropriate. The bottom module directly interacts with the bottom module of system B, so the message is sent across. On the receiving system B the reverse happens, so ultimately (and assuming there were no transmission errors or protocol violations etc.) the message gets delivered in its original form to the topmodule of system B. On protocol errors, a receiving module discards the piece it has received and reports back the error condition to the original source of the piece on the same layer by handing the error message down or in case of the bottom module sending it across. The division of the message or stream of data into pieces and the subsequent reassembly are handled in the layer that introduced the division/reassembly. The reassembly is done at the destination (i.e. not on any intermediate routers). TCP/IP software is organized in four layers. Application Layer. At the highest layer, the services available across a TCP/IP internet are accessed by application programs. The application chooses the style of transport to be used which can be a sequence of individual messages or a continuous stream of bytes. The application program passes data to the transport layer for delivery. Transport Layer. The transport layer provides communication from one application to another. The transport layer may regulate flow of information and provide reliable transport, ensuring that data arrives without error and in sequence. To do so, the receiving side sends back acknowledgments and the sending side retransmits lost pieces called packets. The stream of data is divided into packets by the module and each packet is passed along with a destination address to the next layer for transmission. The layer must accept data from many applications concurrently and therefore also includes codes in the packet header to identify the sending and receiving application program. Internet Layer. The Internet layer handles the communication between machines. Packets to be sent are accepted from the transport layer along with an identification of the receiving machine. The packets are encapsulated in IP datagrams and the datagram headers are filled. A routing algorithm is used to determine if the datagram should be delivered directly or sent to a router. The datagram is passed to the appropriate network interface for transmission. Incoming datagrams are checked for validity and the routing algorithm is used to decide whether the datagram should be processed locally or forwarded. If the datagram is addressed to the local machine, the datagram header is deleted and the appropriate transport protocol for the packet is chosen. ICMP error and control messages are handled as well in this layer. Link Layer. The link layer is responsible for accepting IP datagrams and communicating them on the local network link by whatever technology is suitable. TCP/IP does not concern itself with such details, and simply assumes an available facility. Program translation is divided into four subproblems: compiler, assembler, link editor, and loader. As a result, the translation software is layered as well, allowing the software layers to be designed independently. Noting that the ways to conquer the complexity of program translation could readily be applied to protocols because of the analogy between programming languages and protocols, the designers of the TCP/IP protocol suite were keen on imposing the same layering on the software framework. This can be seen in the TCP/IP layering by considering the translation of a pascal program (message) that is compiled (function of the application layer) into an assembler program that is assembled (function of the transport layer) to object code (pieces) that is linked (function of the Internet layer) together with library object code (routing table) by the link editor, producing relocatable machine code (datagram) that is passed to the loader which fills in the memory locations (ethernet addresses) to produce executable code (network frame) to be loaded (function of the network interface layer) into physical memory (transmission medium). To show just how closely the analogy fits, the terms between parentheses in the previous sentence denote the relevant analogs and the terms written cursively denote data representations. Program translation forms a linear sequence, because each layer's output is passed as input to the next layer. Furthermore, the translation process involves multiple data representations. The same thing is seen happening in protocol software, where multiple protocols define the data representations of the data passed between the software modules. The modules below the application layer are generally considered part of the operating system. Passing data between these modules is much less expensive than passing data between an application program and the transport layer. The boundary between application layer and transport layer is called the operating system boundary. Strictly adhering to a layered model, a practice known as strict layering, is not always the best approach to networking. Strict layering, can have a serious impact on the performance of the implementation, so there is at least a trade-off between simplicity and performance. Another, perhaps more important point can be shown by considering the fact that some of the protocols in the Internet Protocol Suite cannot be expressed using the TCP/IP model, in other words some of the protocols behave in ways not described by the model. To improve on the model, an offending protocol could, perhaps be split up into two protocols, at the cost of one or two extra layers, but there is a hidden caveat, because the model is also used to provide a conceptual view on the suite for the intended users. There is a trade-off to be made here between preciseness for the designer and clarity for the intended user. While the use of protocol layering is today ubiquitous across the field of computer networking, it has been historically criticized by many researchers for two principal reasons. Firstly, abstracting the protocol stack in this way may cause a higher layer to duplicate functionality of a lower layer, a prime example being error recovery on both a per-link basis and an end-to-end basis. Secondly, it is common that a protocol implementation at one layer may require data, state or addressing information that is only present at another layer, thus defeating the point of separating the layers in the first place. For example, TCP uses the ECN field in the IPv4 header as an indication of congestion; IP is a network layer protocol whereas TCP is a transport layer protocol. There are commonly reoccurring problems that occur in the design and implementation of communication protocols and can be addressed by patterns from several different pattern languages: Pattern Language for Application-level Communication Protocols (CommDP), Service Design Patterns, Patterns of Enterprise Application Architecture, Pattern-Oriented Software Architecture: A Pattern Language for Distributed Computing. The first of these pattern languages focuses on the design of protocols and not their implementations. The others address issues in either both areas or just the latter. Formal methods of describing communication syntax are Abstract Syntax Notation One (an ISO standard) and Augmented Backus-Naur form (an IETF standard). Finite state machine models and communicating finite-state machines are used to formally describe the possible interactions of the protocol. For communication to take place, protocols have to be agreed upon. Recall that in digital computing systems, the rules can be expressed by algorithms and datastructures, raising the opportunity for hardware independence. Expressing the algorithms in a portable programming language, makes the protocol software operating system independent. The source code could be considered a protocol specification. This form of specification, however is not suitable for the parties involved. For one thing, this would enforce a source on all parties and for another, proprietary software producers would not accept this. By describing the software interfaces of the modules on paper and agreeing on the interfaces, implementers are free to do it their way. This is referred to as source independence. By specifying the algorithms on paper and detailing hardware dependencies in an unambiguous way, a paper draft is created, that when adhered to and published, ensures interoperability between software and hardware. Such a paper draft can be developed into a protocol standard by getting the approval of a standards organization. To get the approval the paper draft needs to enter and successfully complete the standardization process. This activity is referred to as protocol development. The members of the standards organization agree to adhere to the standard on a voluntary basis. Often the members are in control of large market-shares relevant to the protocol and in many cases, standards are enforced by law or the government, because they are thought to serve an important public interest, so getting approval can be very important for the protocol. It should be noted though that in some cases protocol standards are not sufficient to gain widespread acceptance i.e. sometimes the source code needs to be disclosed and enforced by law or the government in the interest of the public. The need for protocol standards can be shown by looking at what happened to the bi-sync protocol (BSC) invented by IBM. BSC is an early link-level protocol used to connect two separate nodes. It was originally not intended to be used in a multinode network, but doing so revealed several deficiencies of the protocol. In the absence of standardization, manufacturers and organizations felt free to 'enhance' the protocol, creating incompatible versions on their networks. In some cases, this was deliberately done to discourage users from using equipment from other manufacturers. There are more than 50 variants of the original bi-sync protocol. One can assume, that a standard would have prevented at least some of this from happening. In some cases, protocols gain market dominance without going through a standardization process. Such protocols are referred to as de facto standards. De facto standards are common in emerging markets, niche markets, or markets that are monopolized (or oligopolized). They can hold a market in a very negative grip, especially when used to scare away competition. From a historical perspective, standardization should be seen as a measure to counteract the ill-effects of de facto standards. Positive exceptions exist; a 'de facto standard' operating system like GNU/Linux does not have this negative grip on its market, because the sources are published and maintained in an open way, thus inviting competition. Standardization is therefore not the only solution for open systems interconnection. Some of the standards organizations of relevance for communication protocols are the International Organization for Standardization (ISO), the International Telecommunication Union (ITU), the Institute of Electrical and Electronics Engineers (IEEE), and the Internet Engineering Task Force (IETF). The IETF maintains the protocols in use on the Internet. The IEEE controls many software and hardware protocols in the electronics industry for commercial and consumer devices. The ITU is an umbrella organization of telecommunication engineers designing the public switched telephone network (PSTN), as well as many radio communication systems. For marine electronics the NMEA standards are used. The World Wide Web Consortium (W3C) produces protocols and standards for Web technologies. International standards organizations are supposed to be more impartial than local organizations with a national or commercial self-interest to consider. Standards organizations also do research and development for standards of the future. In practice, the standards organizations mentioned, cooperate closely with each other. The standardization process starts off with ISO commissioning a sub-committee workgroup. The workgroup issues working drafts and discussion documents to interested parties (including other standards bodies) in order to provoke discussion and comments. This will generate a lot of questions, much discussion and usually some disagreement on what the standard should provide and if it can satisfy all needs (usually not). All conflicting views should be taken into account, often by way of compromise, to progress to a draft proposal of the working group. The draft proposal is discussed by the member countries' standard bodies and other organizations within each country. Comments and suggestions are collated and national views will be formulated, before the members of ISO vote on the proposal. If rejected, the draft proposal has to consider the objections and counter-proposals to create a new draft proposal for another vote. After a lot of feedback, modification, and compromise the proposal reaches the status of a draft international standard, and ultimately an international standard. Various optional modes of operation, for example to allow for setup of different packet sizes at startup time, because the parties could not reach consensus on the optimum packet size. Parameters that are left undefined or allowed to take on values of a defined set at the discretion of the implementor. This often reflects conflicting views of some of the members. Parameters reserved for future use, reflecting that the members agreed the facility should be provided, but could not reach agreement on how this should be done in the available time. Various inconsistencies and ambiguities will inevitably be found when implementing the standard. International standards are reissued periodically to handle the deficiencies and reflect changing views on the subject. A lesson learned from ARPANET, the predecessor of the Internet, was that standardization of protocols is not enough, because protocols also need a framework to operate. It is therefore important to develop a general-purpose, future-proof framework suitable for structured protocols (such as layered protocols) and their standardization. This would prevent protocol standards with overlapping functionality and would allow clear definition of the responsibilities of a protocol at the different levels (layers). This gave rise to the OSI Open Systems Interconnection reference model (RM/OSI), which is used as a framework for the design of standard protocols and services conforming to the various layer specifications. In the OSI model, communicating systems are assumed to be connected by an underlying physical medium providing a basic (and unspecified) transmission mechanism. The layers above it are numbered (from one to seven); the nth layer is referred to as (n)-layer. Each layer provides service to the layer above it (or at the top to the application process) using the services of the layer immediately below it. The layers communicate with each other by means of an interface, called a service access point. Corresponding layers at each system are called peer entities. To communicate, two peer entities at a given layer use an (n)-protocol, which is implemented by using services of the (n-1)-layer. When systems are not directly connected, intermediate peer entities (called relays) are used. An address uniquely identifies a service access point. The address naming domains need not be restricted to one layer, so it is possible to use just one naming domain for all layers. For each layer there are two types of standards: protocol standards defining how peer entities at a given layer communicate, and service standards defining how a given layer communicates with the layer above it. The Application layer may provide the following services to the application processes: identification of the intended communication partners, establishment of the necessary authority to communicate, determination of availability and authentication of the partners, agreement on privacy mechanisms for the communication, agreement on responsibility for error recovery and procedures for ensuring data integrity, synchronization between cooperating application processes, identification of any constraints on syntax (e.g. character sets and data structures), determination of cost and acceptable quality of service, selection of the dialogue discipline, including required logon and logoff procedures. The presentation layer may provide the following services to the application layer: a request for the establishment of a session, data transfer, negotiation of the syntax to be used between the application layers, any necessary syntax transformations, formatting and special purpose transformations (e.g. data compression and data encryption). The session layer may provide the following services to the presentation layer: establishment and release of session connections, normal and expedited data exchange, a quarantine service which allows the sending presentation entity to instruct the receiving session entity not to release data to its presentation entity without permission, interaction management so presentation entities can control whose turn it is to perform certain control functions, resynchronization of a session connection, reporting of unrecoverable exceptions to the presentation entity. The transport layer provides reliable and transparent data transfer in a cost-effective way as required by the selected quality of service. It may support the multiplexing of several transport connections on to one network connection or split one transport connection into several network connections. The network layer does the setup, maintenance and release of network paths between transport peer entities. When relays are needed, routing and relay functions are provided by this layer. The quality of service is negotiated between network and transport entities at the time the connection is set up. This layer is also responsible for network congestion control. The data link layer does the setup, maintenance and release of data link connections. Errors occurring in the physical layer are detected and may be corrected. Errors are reported to the network layer. The exchange of data link units (including flow control) is defined by this layer. The physical layer describes details like the electrical characteristics of the physical connection, the transmission techniques used, and the setup, maintenance and clearing of physical connections. In contrast to the TCP/IP layering scheme, which assumes a connectionless network, RM/OSI assumed a connection-oriented network. Connection-oriented networks are more suitable for wide area networks and connectionless networks are more suitable for local area networks. Using connections to communicate implies some form of session and (virtual) circuits, hence the (in the TCP/IP model lacking) session layer. The constituent members of ISO were mostly concerned with wide area networks, so development of RM/OSI concentrated on connection oriented networks and connectionless networks were only mentioned in an addendum to RM/OSI. At the time, the IETF had to cope with this and the fact that the Internet needed protocols which simply were not there. As a result, the IETF developed its own standardization process based on "rough consensus and running code". The standardization process is described by RFC2026. Nowadays, the IETF has become a standards organization for the protocols in use on the Internet. RM/OSI has extended its model to include connectionless services and because of this, both TCP and IP could be developed into international standards. Classification schemes for protocols usually focus on domain of use and function. As an example of domain of use, connection-oriented protocols and connectionless protocols are used on connection-oriented networks and connectionless networks respectively. For an example of function consider a tunneling protocol, which is used to encapsulate packets in a high-level protocol, so the packets can be passed across a transport system using the high-level protocol. A layering scheme combines both function and domain of use. The dominant layering schemes are the ones proposed by the IETF and by ISO. Despite the fact that the underlying assumptions of the layering schemes are different enough to warrant distinguishing the two, it is a common practice to compare the two by relating common protocols to the layers of the two schemes. For an example of this practice see: Lists of network protocols. The layering scheme from the IETF is called Internet layering or TCP/IP layering. The functionality of the layers has been described in the section on software layering and an overview of protocols using this scheme is given in the article on Internet protocols. The layering scheme from ISO is called the OSI model or ISO layering. The functionality of the layers has been described in the section on the future of standardization and an overview of protocols using this scheme is given in the article on OSI protocols. In networking equipment configuration, a term-of-art distinction is often drawn: The term "protocol" strictly refers to the transport layer, and the term "service" refers to protocols utilizing a "protocol" for transport. In the common case of the TCP and UDP "protocols", "services" are distinguished by their port numbers. Conformance to these port numbers is voluntary, so in content inspection systems the term "service" strictly refers to port numbers, and the term "application" is often used to refer to protocols identified through inspection signatures. Protocols upon which transport layer relies, like IPv4, are distinguished by their "address family." ^ Failure to receive an acknowledgement indicates that either the original transmission or the acknowledgement was lost. The sender has not means to distinguish these cases and therefore, to ensure all data is received, must make the conservative assumption that the original transmission was lost. ^ a b Comer 2000, Sect. 11.2 - The Need For Multiple Protocols, p. 177, "They (protocols) are to communication what programming languages are to computation"
^ a b c Comer 2000, Sect. 1.3 - Internet Services, p. 3, "Protocols are to communication what algorithms are to computation"
^ Ben-Ari 1982, chapter 2 - The concurrent programming abstraction, p. 18-19, states the same. ^ Ben-Ari 1982, Section 2.7 - Summary, p. 27, summarizes the concurrent programming abstraction. ^ a b Marsden 1986, Section 6.1 - Why are standards necessary?, p. 64-65, uses BSC as an example to show the need for both standard protocols and a standard framework. ^ Comer 2000, Sect. 11.2 - The Need For Multiple Protocols, p. 177, explains this by drawing analogies between computer communication and programming languages. ^ a b Sect. 11.10 - The Disadvantage Of Layering, p. 192, states: layering forms the basis for protocol design. ^ a b Comer 2000, Sect. 11.2 - The Need For Multiple Protocols, p. 177, states the same. ^ a b Comer 2000, Sect. 11.3 - The Conceptual Layers Of Protocol Software, p. 178, "Each layer takes responsibility for handling one part of the problem." ^ Comer 2000, Sect. 11.11 - The Basic Idea Behind Multiplexing And Demultiplexing, p. 192, states the same. ^ Marsden 1986, Chapter 3 - Fundamental protocol concepts and problem areas, p. 26-42, explains much of the following. ^ Comer 2000, Sect. 7.7.4 - Datagram Size, Network MTU, and Fragmentation, p. 104, Explains fragmentation and the effect on the header of the fragments. ^ Comer 2000, Chapter 4 - Classful Internet Addresses, p. 64-67;71. ^ Marsden 1986, Section 14.3 - Layering concepts and general definitions, p. 187, explains address mapping. ^ Marsden 1986, Section 3.2 - Detection and transmission errors, p. 27, explains the advantages of backward error correction. ^ Marsden 1986, Section 3.3 - Acknowledgement, p. 28-33, explains the advantages of positive only acknowledgement and mentions datagram protocols as exceptions. ^ Marsden 1986, Section 3.4 - Loss of information - timeouts and retries, p. 33-34. ^ Marsden 1986, Section 3.5 - Direction of information flow, p. 34-35, explains master/slave and the negotiations to gain control. ^ Marsden 1986, Section 3.6 - Sequence control, p. 35-36, explains how packets get lost and how sequencing solves this. ^ Marsden 1986, Section 3.7 - Flow control, p. 36-38. ^ Ben-Ari 1982, in his preface, p. xiii. ^ Ben-Ari 1982, in his preface, p. xiv. ^ Hoare 1985, Chapter 4 - Communication, p. 133, deals with communication. ^ Comer 2000, Sect. 11.2 - The Need For Multiple Protocols, p. 177, states more or less the same, using other analogies. ^ a b Comer 2000, Sect. 11.7 - The Protocol Layering Principle, p. 187, explains layered protocols. ^ a b Comer 2000, Sect. 11.2 - The Need For Multiple Protocols, p. 177, introduces the decomposition in layers. ^ Comer 2000, Glossary of Internetworking terms, p.686: term encapsulation. ^ Comer 2000, Sect. 11.5.1 - The TCP/IP 5-Layer Reference Model, p. 184, Describes the transformations of messages or streams that can be observed in the protocol layers. ^ Comer 2000, Sect. 2.4.10 - Ethernet Frame Format, p. 30, Ethernet frames are used as an example for administrative data for the protocol itself. ^ Comer 2000, Sect. 11.4 - Functionality Of The Layers, p. 181, states the same about the software organization. ^ Comer 2000, Sect. 3.3 - Network-Level Interconnection, p. 55, explains universal interconnection and internetworking. ^ Comer 2000, Sect. 4.4 - Addresses Specify Network Connections, p. 86, explains this. ^ Comer 2000, Sect. 4.3 - The Original Classful Addressing Scheme, p. 64, explains the address scheme, netid and routing. ^ Comer 2000, Sect. 5.13 - Summary, p. 86, explains ARP. ^ Comer 2000, Sect. 2.11 - Other Technologies Over Which TCP/IP Has Been Used, p. 46, states the same. ^ Comer 2000, Sect. 8.3.2 - Indirect Delivery, p. 118, states the same. ^ Comer 2000, Sect. 8.5 - Next-Hop Routing, p. 120, gives details on the routing table. ^ Comer 2000, Sect. 8.6 - Default Routes, p. 121, explains default routing and its use. ^ Comer 2000, Sect. 3.8 - All Networks Are Equal, p. 59, states the same. ^ Comer 2000, Sect. 7.5 - Connectionless Delivery System, p. 97, explains the delivery system. ^ Comer 2000, Sect. 7.6 - Purposes Of The Internet Protocol, p. 97, states the same. ^ Comer 2000, Sect. 2.11.1 - X25NET And Tunnels, p. 46-47, explains tunneling X.25 and mentions ATM. ^ Comer 2000, Sect. 13.1 - Introduction, p. 209, introduces TCP. ^ Comer 2000, Sect. 12.10 - Summary, p. 206, explains UDP. ^ Comer 2000, Sect. 11.3 - The Conceptual Layers Of Protocol Software, p. 179, the first two paragraphs describe the sending of a message through successive layers. ^ Comer 2000, Sect. 9.3 - Error Reporting vs. Error Correction, p. 131, describes the ICMP protocol that is used to handle datagram errors. ^ Comer 2000, Sect. 7.7.5 - Reassembly Of Fragments, p. 104, describes reassembly of datagrams. ^ Comer 2000, Sect. 11.5.1 - The TCP/IP 5-Layer Reference Model, p. 184, explains functionality of the layers. ^ Comer 2000, Sect. 11.2 - The need for multiple protocols, p. 178, explains similarities protocol software and compiler, assembler, linker, loader. ^ Comer 2000, Sect. 11.9.1 - Operating System Boundary, p. 192, describes the operating system boundary. ^ IETF 1989, Sect 1.3.1 - Organization, p. 15, 2nd paragraph: many design choices involve creative "breaking" of strict layering. ^ Comer 2000, Sect. 11.10 - The Disadvantage Of Layering, p. 192, explains why "strict layering can be extremely inefficient" giving examples of optimizations. ^ IETF 1989, Sect 1.3.1 - Organization, p. 15, 2nd paragraph, explaining why "strict layering is an imperfect model"
^ IETF 1989, Sect 1.3.1 - Organization, p. 15, states: This layerist organization was chosen for simplicity and clarity. ^ Wakeman, I (Jan 1992). "Layering considered harmful". IEEE Network: 20–24. ^ Kurose, James; Ross, Kieth (2005). Computer Networking: A Top-Down Approach. Pearson. ^ Jorge Edison Lascano, Stephen Clyde, and Ali Raza. "Communication-protocol Design Patterns (CommDP) - COMMDP." [Online]. Available: http://commdp.serv.usu.edu/wiki/index.php/Communication-protocol_Design_Patterns_(CommDP). [Accessed: 17-Mar-2017]. ^ J. E. Lascano and S. Clyde, "A Pattern Language for Application-level Communication Protocols," presented at the ICSEA 2016, The Eleventh International Conference on Software Engineering Advances, 2016, pp. 22–30. ^ R. Daigneau, Service Design Patterns: Fundamental Design Solutions for SOAP/WSDL and RESTful Web Services, 1 edition. Upper Saddle River, NJ: Addison-Wesley Professional, 2011. ^ M. Fowler, Patterns of Enterprise Application Architecture, 1 edition. Boston: Addison-Wesley Professional, 2002. ^ F. Buschmann, K. Henney, and D. C. Schmidt, Pattern-Oriented Software Architecture Volume 4: A Pattern Language for Distributed Computing, Volume 4 edition. Chichester England; New York: Wiley, 2007. ^ Bochmann, G. (1978). "Finite state description of communication protocols". Computer Networks (1976). 2 (4–5): 361–372. doi:10.1016/0376-5075(78)90015-6. ^ Comer 2000, Glossary of Internetworking Terms and Abbreviations, p. 704, term protocol. ^ Brand, Daniel; Zafiropulo, Pitro (1983). "On Communicating Finite-State Machines". Journal of the ACM. 30 (2): 323. doi:10.1145/322374.322380. ^ Marsden 1986, Section 6.3 - Advantages of standardisation, p. 66-67, states the same. ^ Marsden 1986, Section 6.4 - Some problems with standardisation, p. 67, follows HDLC to illustrate the process. ^ Marsden 1986, Section 6.1 - Why are standards necessary?, p. 65, explains lessons learned from ARPANET. ^ Marsden 1986, Section 14.1 - Introduction, p. 181, introduces OSI. ^ Marsden 1986, Section 14.3 - Layering concepts and general definitions, p. 183-185, explains terminology. ^ Marsden 1986, Section 14.4 - The application layer, p. 188, explains this. ^ Marsden 1986, Section 14.5 - The presentation layer, p. 189, explains this. ^ Marsden 1986, Section 14.6 - The session layer, p. 190, explains this. ^ Marsden 1986, Section 14.7 - The transport layer, p. 191, explains this. ^ Marsden 1986, Section 14.8 - The network layer, p. 192, explains this. ^ Marsden 1986, Section 14.9 - The data link layer, p. 194, explains this. ^ Marsden 1986, Section 14.10 - The physical layer, p. 195, explains this. ^ Marsden 1986, Section 14.11 - Connectionless mode and RM/OSI, p. 195, mentions this. ^ Comer 2000, Section 1.9 - Internet Protocols And Standardization, p. 12, explains why the IETF did not use existing protocols. ^ Comer 2000, Sect. 11.5.1 - The TCP/IP 5-Layer Reference Model, p. 183, states the same. Douglas E. Comer (2000). Internetworking with TCP/IP - Principles, Protocols and Architecture (4th ed.). Prentice Hall. ISBN 0-13-018380-6. In particular Ch.11 Protocol layering. Also has a RFC guide and a Glossary of Internetworking Terms and Abbreviations. Internet Engineering Task Force abbr. IETF (1989): RFC1122, Requirements for Internet Hosts -- Communication Layers, R. Braden (ed. ), Available online at http://tools.ietf.org/html/rfc1122. Describes TCP/IP to the implementors of protocolsoftware. In particular the introduction gives an overview of the design goals of the suite. M. Ben-Ari (1982): Principles of concurrent programming 10th Print. Prentice Hall International, ISBN 0-13-701078-8. R.D. Tennent (1981): Principles of programming languages 10th Print. Prentice Hall International, ISBN 0-13-709873-1. Brian W Marsden (1986): Communication network protocols 2nd Edition. Chartwell Bratt, ISBN 0-86238-106-1. Andrew S. Tanenbaum (1984): Structured computer organization 10th Print. Prentice Hall International, ISBN 0-13-854605-3. Radia Perlman, Interconnections: Bridges, Routers, Switches, and Internetworking Protocols (2nd Edition). Addison-Wesley 1999. ISBN 0-201-63448-1. In particular Ch. 18 on "network design folklore".